Electric Vehicles are gaining in popularity in the US. While still a small fraction of vehicles sold – about 1% – you’re starting to see more and more Teslas, Volts, Leafs, and others. And while there may not be a lot of them, it only takes two or three Owners in your Association who have an EV or want to buy an EV for your Board to receive an inquiry about how you’re going to handle them. Today, we’ll cover how to create an effective Condo Association Electric Vehicle policy. Per Wikipedia, the Leaf and the Model S are the two most popular electric vehicles. First and foremost, you need to consider if you have the infrastructure to handle an Electric Vehicle charging station. To set up a charging station, at a bare minimum, you need two things: a power outlet and a parking space. Ideally, you want to install an outdoor rated Level 2 charger, which is what most EV owners want. The space might be a limited common element assigned to an Owner, or it might be a public spot (like a guest spot) that can be used by many. Your Association’s infrastructure is going to drive how you create an effective Condo Association Electric Vehicle policy. Now that you’ve got your infrastructure, you need to decide how you’re going to sell your electricity. While electric cars aren’t incredibly expensive to charge, you’re still looking at up to a few hundred bucks per year per car. You could take the approach that the Association will pay for the electricity. You also could meter the exact electricity using a digital meter and then bill the Owners. This adds in several factors, such as making sure Owners are accurately reporting, having someone read the meter, etc. You also could ballpark the electricity costs and simply charge all EV users an annual fee to account for both electricity and wear and tear on the electrical equipment. My recommendation is to add a fixed fee that is fair and reasonable to both parties. It is easier to administer than some of the other options. It may be that you have a garage with ample power running through it. One option could potentially be the installation of outlets, at Owner expense, at their parking space. They can then plug their cars in and they’re off to the races (literally). However, there are a few downsides to this approach. You may end up with a haphazard installation of outlets in your garage. You also will need to decide if you’re going to let Owners have that electricity for free, or if you’re going to charge them somehow. You also may run out of power at your circuit breaker – enough Level 2 chargers (or even basic 110 volt outlets) will start to stretch the power for your garage; who will pay to upgrade the amperage box? Pros: Local installation at existing garage spots. Owners don’t fight over access since the outlets are assigned to specific parking spaces. Owners pay installation. Cons: Can end up with a hodgepodge of installations. Becomes something only certain Owners can use and not everyone. Owners may not want to pay for installations and will be unhappy. Infrastructure costs for the Association. A high end level 2 charger (credit: Lowes Hardware). If your Association has guest spots or other parking spots it owns, you could convert those spots to community charging stations. 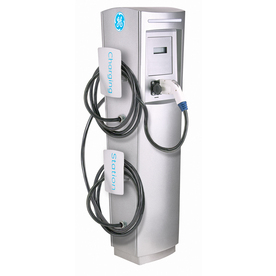 This allows you to install centralized locations for Owners to charge their EVs. While you lose the parking spots, you gain an amenity that may be attractive to prospective buyers. You’ll need to police the spots and make sure that only permitted Owners are charging there. You also will need to tackle the aforementioned reimbursement issue. Optionally, you can also make this process easier by outsourcing to a third party provider like eVGO, Plugshare, etc. Many of them have “private” options where the station is only accessible to your building, and you can manage (and bill) usage through their service. You also can get a little bit of revenue from cost sharing. Pros: Central location. Building-wide amenity. Easier to monitor. Cons: Give up parking space(s). Can lead to overcrowding of the amenity. Additional administration and installation costs. Doing nothing is always a valid, if sometimes unpopular decision. There are infrastructure and administration costs to getting “EV ready” as a building. Unless you have a large number of EV Owners, there won’t be any urgency to embrace an EV policy. Sometimes doing nothing may be the most effective Condo Association Electric Vehicle policy for your community. If you’re a forward-leaning Association, you’ll want to start considering how to handle Electric Vehicles. Even if you decide to do nothing, as always, you want to be proactive, not reactive. Creating an effective Condo Association Electric Vehicle policy will put your Association in the driver’s seat when it comes to new technology.